n an earlier blog entry I described my bi-amping adventures. 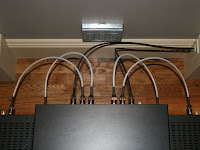 A key part of getting the whole setup put together was building balanced interconnects. I made two 10m runs of Belden 89207 to connect the pre-amp (at the back of the room) to the crossover (up front) and four 1/2m silver interconnects to link the crossover to the amps. As an aside, Rane provides all kinds of other great audio documentation in their RaneNotes. Most balanced cables use XLR connectors. The ones I made are no exception. When making any audio cable, Rane provides a great document on Sound System Interconnection[PDF]. There are a lot of exhaustive explainations on the Internet about how balanced cabling works. But the Coles-Notes of it is: a balanced cable, or more correctly, a balanced system, works to eliminate any noise being introduced along the length of the cable. Now consider if some kind of noise is introduced along the wire. For the most part, the noise will affect the Hot and Cold in the same way. Once at its destination (the load), effectively the Cold can be re-inverted to the same phase as the Hot. Notice, by doing this, we’ve also inverted the noise that was introduced to the Cold signal. This inverted noise, coupled with the noise on the Hot will cancel, leaving you with the combined original signal. Clever, eh? So technically, the "balanced" part of a balanced cable has more to do with the source and load devices than the actual cable. However there are a few features of the wire itself which helps reduce the chances of noise being introduced. The twisting of the two signal wires help reduce interference from electromagnetic induction. The ground, usually a shielding mesh which surrounds the twisted pair, provides a dedicated ground, not part of the signal like an unbalanced cable, and prevents possible ground loops. 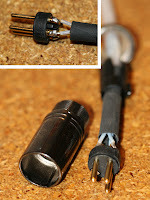 When making such short interconnects (in my case from the crossover to the amps), the benefits gained with balanced cables is likely very little. Since there is more opportunity for external noise to be added to the signal in a longer length, my 10m interconnects from the pre-amp to the crossover are a more typical use of balanced cables. However, even with a very short cable there is still a chance of external noise, especially in an unfriendly environment. 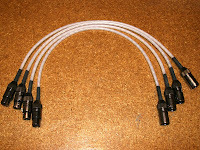 Also, regardless of length, the XLR connector provides a good, secure locking connection. Teflon (polytetrafluoroethylene, a.k.a. PTFE) is often used as a wire insulator because it's such a good dielectric (it has a resistivity of 1022 to 1024 Ω·m – that’s about 10,000,000,000 times that of glass! ...more about resistivity below). Its slippery nature and high heat resistance is great for making omelets, however, in this case, these properties aren’t of much interest. I decided to simply braid the three wires. There are a lot of articles and theories about the optimal relative placement of the three conductors. I’ve read too many different and opposing opinions – so I decided to start simple with an ordinary braid and make my own judgment as to its performance. For sleeving, I put the braided trio in a semi-transparent 1/4" sleeve - actually the sleeve is plastic tubing typically used as the waterline to the ice maker in your refrigerator. There are a ton of other cheap sleeving options including using shoelaces or no sleeving at all. Some folks will claim there are acoustic properties to different insulators and sleeves – maybe - but my considerations were primarily protection and secondarily aesthetics. So why use silver wire instead of copper? The long and short of it is that silver conducts electricity better than copper. How much better? Well only an audiophile is unbalanced enough to justify the cost-benefit (yah, I know, bad joke). Conductivity, actually on the flip-side it's called resistivity, is measured in ohm meters (Ω·m). The resistivity of silver (Ag) is 15.87nΩ·m (at 20°C). The resistivity of copper (Cu) is a poky 16.78nΩ·m (again, at 20°C). A 24AWG wire has a cross-section area of 0.205mm2 or 2.05x10-7m2. Divide this by a length of 0.5m. Now solve for R when ρ is 1.587x10-8Ω·m. So for an equivalent copper wire, ρ is 1.678x10-8Ω·m. ...a difference of a whopping 0.0022Ω! Okay, so not a huge difference but it is a 5.4% improvement over copper. So you've got two options: use slightly heavier gauge copper, or spend way more, use silver, swear you can hear the difference and do the math to try to prove it.